Harper, Liberia - On September 21, UPF-Liberia celebrated the International Day of Peace in both Monrovia, the capital, and Harper, in Maryland County. In Harper, Rev. 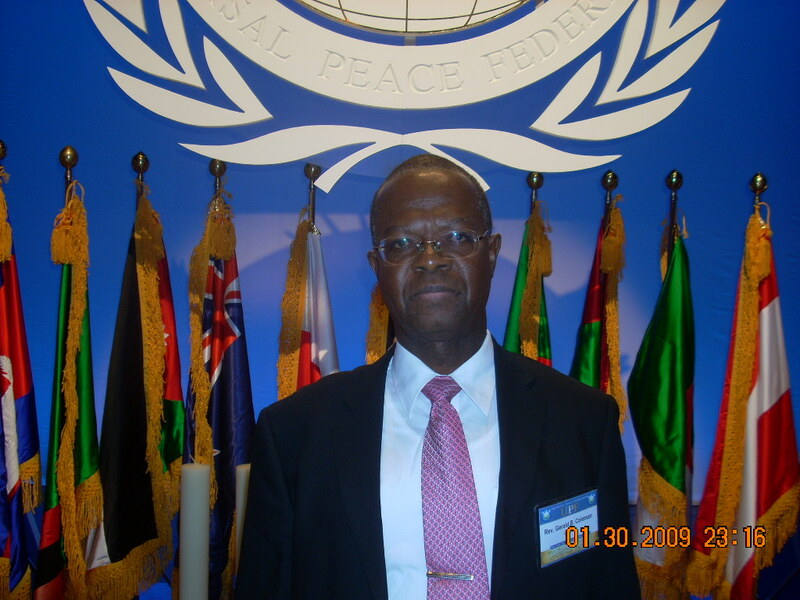 Gerald B. Coleman, Secretary General of UPF-Liberia, gave the keynote address on the theme of including peace education in the national reconciliation program. Harper, Liberia - A tree planting ceremony took place at the City Hall of Harper in Maryland County in commemoration of the International Day of Peace, September 21. Amb. Gerald B. Coleman, Secretary General of UPF-Liberia and Dean of the College of Engineering & Technology at Tubman University in Harper, gave the congratulatory address. Pursuant to its core mandate to promote peace, justice, and reconciliation, the Truth and Reconciliation Commission of Liberia for three years embarked upon series of processes in the implementation of its mandate. Monrovia, Liberia - Only once in the history of a nation should a Truth and Reconciliation Commission be needed. In reviewing the conflict that began in 1979 and continued until 1993, the commission reviewed the nation’s past with the aim of charting a better future. Washington, DC, USA - “Be at home!” was H.E. Ambassador Nathaniel Barnes’ greeting as each guest entered the ambassadorial residence as the sun set on September 23. With his wife, Dawn Barnes, at his side, Ambassador Barnes proceeded to host this special gathering of peacemakers and friends of Liberia, commemorating the UN International Day of Peace. Monrovia, Liberia - The International Colloquium on Women’s Empowerment, Leadership Development, International Peace and Security was held on March 7-8, 2009 in Monrovia, Liberia. The event was co-hosted by H.E. Ellen Johnson Sirleaf, President of Liberia, the first African female president, along with H.E. Tarja Kaarina Halonen, LLM, the first woman to be president of Finland. The monthly meeting of Ambassadors for Peace in Liberia was held at the Peace House in Monrovia on February 21 to discuss matters of mutual concern. Collective support is needed to make an impact in the rebuilding of our fragile democracy into a strong, sustainable and peaceful democracy. Liberia, Africa’s oldest independent republic, has been plagued with a myriad of political, economic, social, and at times, religious problems that conspired over the years to subject its citizens to numerous obstacles that did not permit sustainable growth and viable national progress. Pursuant to its core mandate to promote peace, justice and reconciliation, the Truth and Reconciliation Commission (TRC) of Liberia for three years embarked upon series of processes in the implementation of its mandate. A key component of the Commission’s work was the holding of hearings in the 15 counties of Liberia and the United States of America in accommodation of Liberians in the Diaspora. A delegation of Japanese goodwill ambassadors paid a courtesy call on President Ellen Johnson-Sirleaf in Monrovia. The six-man delegation headed by Mrs. Ayumi Hasegawa is in the country to identify with President Johnson-Sirleaf and Liberians in general on the reconstruction of the country. Not only has poverty been feminized but so have wars. Efforts to support peacemaking and peacebuilding for women must be hailed. Women must not be merely the victims but also the victors. Ganta City in Nimba County became the site of the first county-level Peace Council in Liberia, which met on July 31, 2006 with nearly 800 persons in attendance. The National Peace Council (NPC) of Liberia was launched May 6 in Monrovia by the President of Liberia, Mrs. Ellen Johnson-Sirleaf, who was represented by Youth & Sports Minister, Councellor Jamessetta Howard Wolokollie at the Monrovia City Hall. Support for the work of the NPC was declared by a representative from UNMIL, the UN mission in Liberia. The Universal Peace Federation (UPF), a peace building organization in the country, has been urged to assist the Truth and Reconciliation Commission (TRC) in order to carry out its mandates to find root causes of the past war in the country. In Liberia, life is very basic. Food, paper, electricity — they are not to be taken for granted. It has been awhile since I have been in this area of Africa, but this nation has experienced 20 years of bloody civil war. Our Peace Conference is drawing some very good representatives from Liberia and Sierra Leone and a few from Guinea. All have suffered violence that flows back an forth like raw sewage on the incoming and outgoing tides. You can not have peace in all, if peace is missing in one of these nations.